The high-efficiency, high-density isolated DC-DC converter built by Khaligh's team for the competition. A student team led by Associate Professor Alireza Khaligh (ECE/ISR) won the Best Presentation Award at the 2017 IEEE International Future Energy Challenge (IFEC), July 24-25 at Virginia Tech in Blacksburg, Va. Besides Khaligh, team members included ECE undergraduate students Gary Cooke, Samira Nikpour, Alexander Massimo Fiore, and Alexander Beall; and graduate students Peiwen He and Ayan Mallik. This is the first year the University of Maryland participated in the competition. IFEC is an international undergraduate competition for innovation, conservation, and effective use of electrical energy, open to college and university student teams from recognized engineering programs in any location. Each team is required to have a minimum of three undergraduate students and up to two graduate students, whose participation was limited to technical assistants. IFEC is sponsored by the Institute of Electrical and Electronics Engineers (IEEE) Power Electronics Society (PELS), Power & Energy Society (PES), Industry Application Society (IAS) and Power Sources Manufacturers Association (PSMA). 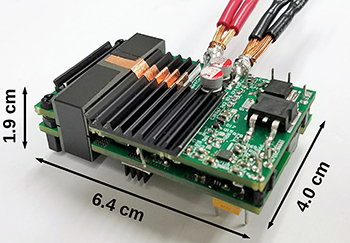 The 2017 challenge was to build a high-efficiency, high-density isolated DC-DC converter. The demands for these types of converters have been growing rapidly in recent years, especially for computer, telecommunication, data center, battery charger, industrial, and aerospace applications. Collectively, these products consume more than 10 percent of all electric power, and even a 1 percent efficiency improvement in this industry sector would represent tremendous energy saving today. Moreover, with the increase of cloud computing and big data, it is expected that data centers alone will consume 10 percent of electricity generated by 2020—just three years from now.